Jolice Truter is a dancer form South Africa and lives in London. Her company is called Alice Imagines. It is structured as a base for the further development of her career. She trained in Australia and has performed with Ballet and Contemporary Companies and is currently freelancing. She is also an experienced ballet and Pilates Teacher. Marija Krtolica is an independent choreographer, performer & certified yoga teacher. Over the past ten years Marija has shown her work in New York City in venues such as Judson Church, Dixon place, Brecht Forum, Washington Square United Methodist Church, Locus Gallery, Context space (Highway Initiative), Construction Company, Raw Space Theatre, Broom St. Studio etc. Etta Ermini Dance Theatre has been founded in 2004 by choreographer and director Etta Ermini. The physical theatre/dance theatre pieces are choreographed by Etta Ermini and devised in collaboration with the performers. The work is based on narrative stimuli and a quirky, humorous and highly individual movement vocabulary is created through improvisation. Elements of the Absurd Theatre are explored through character-based acting as well as through strong physical movement sequences. The scripts are inspired by real events and the mood of the work is often quirky and comical. We are not a dance company; we are friends. This piece was presented at Middlesex University in January 2008 as part of my MA in Choreography and was marked with a distinction. Performers come from various art backgrounds (music, dance, performance art) and not everybody was trained in dance. Danai Pappa is a London based artist. Was born in Greece, trained in ballet and contemporary dance and holds three degrees (Dance Teaching, Museum Studies, Archaeology). She has collaborated with dancers, choreographers and visual artists with a special interest in site-specific performances. I am a 29 year old dancer and choreographer coming from Athens, Greece. I have trained in Ballet, Graham, Cunningham, Release, and Contact Improvisation. I have been awarded a scholarship from the State Scholarship Foundation of Greece (IKY) to fund my postgraduate dance studies in England. I completed a Master in European Dance Theatre Practice at Laban, London and I am currently doing practice-based research at the University of Surrey leading to a PhD. The Artistic presence of the town provides our company with the inspiration and theatrical encouragement to create activities, events and performances that are fresh and exciting to our audiences. 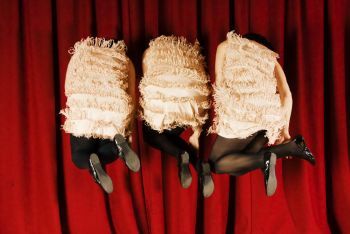 Project Mashed Potato is a dynamic new performance company. 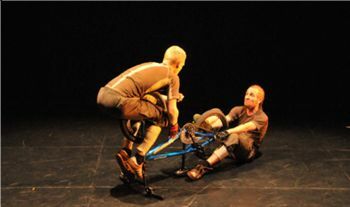 Founded by Dancer/Choreographer Rachel Birch-Lawson and Composer/Musician Jack James, Project Mashed Potato’s collective artistic talent focus on collaboration to develop choreographed and improvised work and run improvisation jams, developing an ever widening audience for dance performance. They are committed to creating engaging, stimulating work that forges links between different artistic disciplines. Both Jonathan McCann and Debbie Shine trained at The London College of Dance and have worked on various projects together. The company started in 2007 with The raising of Lazzaro, a solo dance theatre piece that was successfully presented in Milan for the opening of Moavero Art Studio. After this rewarding experience, the company started working on Love for sale, which was successfully presented as part of Resolution!2008. A fresh, young dance company, Cloud Dance has attracted an international set of talented dance artists eager to produce stunning performances. The eclectic mix of characters, styles and choreographers come together to bring audiences a unique experience of the art of dance. Cloud Dance aims to act as a bridge between the practice of dance and professional dance companies – giving artists the opportunity to train and performance under the auspices of a company while also pursuing other prospects that come their way. MIKS is a dance collective formed by Anaïs Bouts, Sara Lindstrom and Ida Uvaas in 2005. MIKS is intended to be a vehicle for artists to create work collectively, independently and by bringing in external choreographers and collaborators. Through this collaborative approach, MIKS aim to create an intimacy between performers and audience, and explore the relationship between the two in their provocative and entertaining performances.